Geren on "Former Fetus" Signs: House "Not a College Dormitory"
State Rep. Charlie Geren, R-Fort Worth, on Thursday explained why he removed signs at the Capitol identifying some legislators as former fetuses. 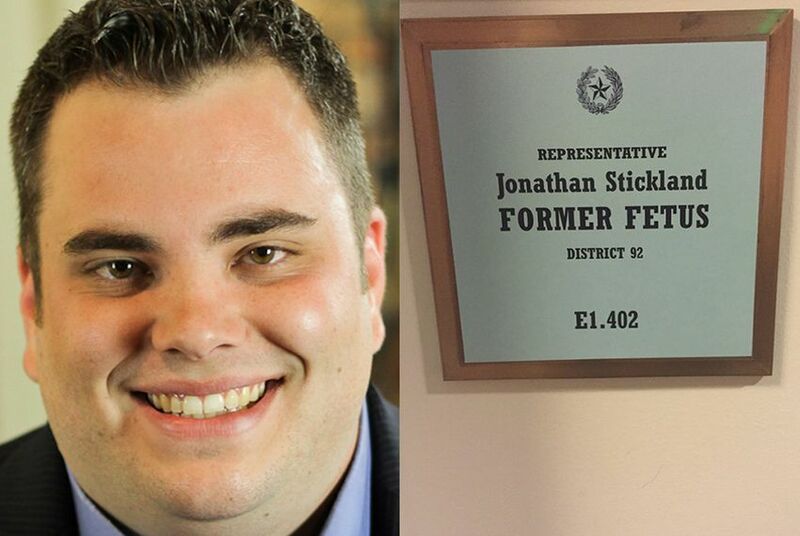 State Rep. Jonathan Stickland, R-Bedford. Saying the Capitol is "not a college dormitory," the Texas House's top rules enforcer took to the floor Thursday morning to explain his decision to take down signs identifying some members as former fetuses. "The halls of this building are sacred to all of us, and we should treat them this way," said state Rep. Charlie Geren, the Fort Worth Republican who chairs the House Administration Committee. Geren reiterated that rules from the State Preservation Board prohibit signage on the walls of the Capitol building. He said signs may be understandable in some cases, like Rep. Charles "Doc" Anderson closing his office as a result of his wife's death. The anti-abortion Texas Right to Life had worked with some members to produce the signs and let the legislators decide how they wanted to display them. The effort was timed to coincide with Planned Parenthood's Lobby Day. State Rep. Jonathan Stickland, R-Bedford, on Wednesday accused Geren of intimidating his staff by removing the sign outside his office. Geren disputed Stickland's account and suggested the Bedford Republican was "acting like a child."